While Arpaio had hinted at a run for months, many political insiders doubted his interest in actually running for the seat currently held by Sen. Jeff Flake, who announced last year that he wouldn’t run again. 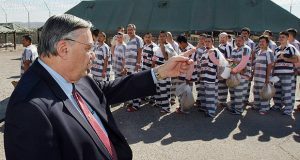 A federal judge has upheld the validity of former Sheriff Joe Arpaio's presidential pardon despite claims from critics that letting his clemency stand would encourage officials to disobey future court orders. The U.S. Justice Department said in a filing Monday that it agreed with Arpaio's attorneys who argued the lawman's conviction and the 14-page ruling should be voided. A federal judge will hear arguments in October over whether she should set aside the criminal contempt of court conviction of Joe Arpaio. 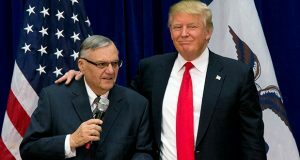 President Donald Trump spared former Arizona Sheriff Joe Arpaio the prospect of serving jail time in granting the first pardon of his turbulent tenure, wiping away the lawman's recent federal conviction stemming from his immigration patrols that focused on Latinos. President Donald Trump has pardoned former sheriff Joe Arpaio following his conviction for intentionally disobeying a judge's order in an immigration case.